1. Preheat the oven to 160°C, gas mark 3. 2. Put the butter, sugar, syrup, honey, treacle and orange zest in a saucepan over medium heat and cook until melted. Stir well, then remove from the heat and allow to cool slightly while you continue with the recipe. 3. Sift the flour into a mixing bowl and add the ground ginger, mixed spice, cinnamon and cloves and two-thirds of the chopped ginger. Mix together. 4. Add the cooled melted mixture, followed by the eggs and milk. Mix thoroughly with a wooden spoon. 5. Spoon the mixture into the prepared loaf pan and bake in the preheated oven for about 1 hour. The cake should be risen and deep golden brown. 1. Put the jam, 2 tbsp of the reserved ginger syrup, the honey and remaining chopped preserved ginger in a saucepan over a low heat. Heat gently until it starts to bubble. Set aside until the cake has baked. It can be warmed up later if necessary. 2. 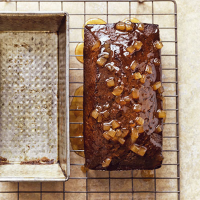 Remove the baked cake from the oven, carefully tip it out of the pan and set it on a wire rack. Put the hot glaze over it and serve warm. This recipe is an extract from Pâtisserie at Home by Will Torrent, photographs by Jonathan Gregson (Ryland Peters & Small, £19.99).